Pirate101 announced today that they are going to be celebrating "Pirates de Mayo." Pirates day Mayo is centered around Cool Ranch and Pirate101 is celebrating in many ways! Many items will be on sale in the Crown Shop for up to 30% off. This includes companions, ship parts, mounts and more! They have even added a new housing item, the Gobbler Pinata! They are also giving the Official fansites codes to have amazing contests, so be sure to check out the complete list of fansites to make sure you don't miss anything! And that's not all either! 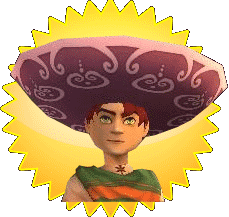 Kingsisle is so awesome that they are giving every player who logs on a free Sombrero, the Novillero's Hat. To redeem yours, click this link and type in the code bueno.